At Harvest Kids, your child won’t have a chance to be bored! 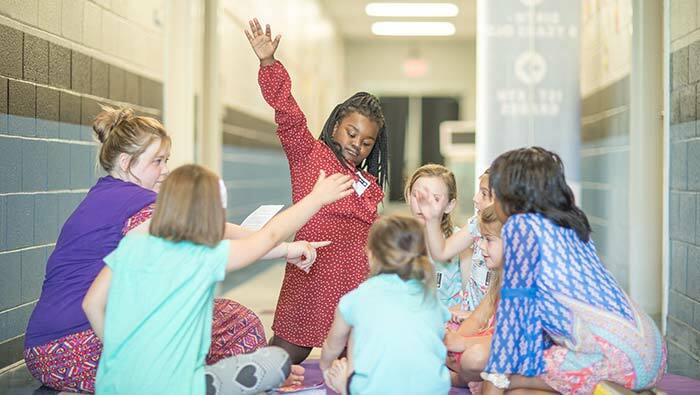 Newborns through 5th graders have a ton of fun as they learn about Jesus through worship, age-specific lessons, and a variety of exciting activities. Our goal is to make Sunday your child’s favorite day of the week. Harvest Kids is fully staffed with adults and high school students who are committed to ministering to children. You can be confident that your child is well-cared for and will love it. Harvest Kids meets at the same time as our Worship Gathering for adults. So while you are enjoying the worship and teaching in the Auditorium, your kids are experiencing God in their language! We have a check-in system with parent identification tags and team members who have all passed a comprehensive background check. We also have a system in place to contact you during the Worship Gathering if necessary. Harvest Kids leaders deliver fun and memorable teachings from the Bible that make it easy for your child to learn. Your kids will have a blast while learning about Jesus. Toddlers are like fertile soil and we help plant seeds of Truth through worship songs, Bible stories with object lessons, and praying together as a class. What a perfect time to start learning about our amazing God in a personal and powerful way. Our focus in this class is giving our children the meat of God’s Word, encountering His presence, and training them to minister in their homes, schools, and communities. We do this using high-energy songs, object lessons, and small group interactions. We firmly believe that children are the church of today!